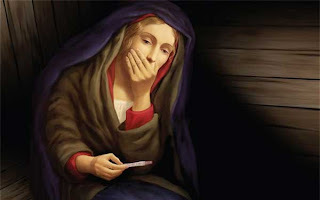 St. Matthews in the City in Aukland, New Zealand put up the billboard illustrated above, which depicts the Virgin Mary looking with concern at the results of a home pregnancy test. It was torn down Saturday morning by one Arthur Skinner who leads a protesting group calling itself "Catholic Action Group". "Even people who aren't Catholics know instinctively you don't attack the Blessed Virgin who gave us the saviour of the world," said Skinner. "Half the world is celebrating Christmas at the moment, and to see this at this time is an absolute abomination." "The blessed virgin doesn't need a pregnancy test, she knew she was pregnant, she agreed to it and she would have been full of joy to know that she had conceived our lord." Skinner freely admits he is guilty of vandalising the billboard. "If they want to arrest me then so be it," he said. Glynn Cardy, the Vicar at St. Matthews, contends that Mary would have been accused of having an illegitimate child and the the billboard was intended so honor her courage and to stimulate thinking about what it would be like to be poor and pregnant. "It's really asking people to remember, coming into Christmas, that this was a woman of tremendous courage and faith, that she was not some plasticised icon, somebody who doesn't have human feelings." The church describes itself as catering to a progressive congregation.